Efficient ideas for your business! How to get smart savings with efficient technologies? How could the latest lighting technology make your building, renovation or city enhancement project into something truly spectacular? The experts at Progetto Energia Services are ready to answer such questions, brainstorm about the possibilities, and assist you in achieving the best solution for your business. 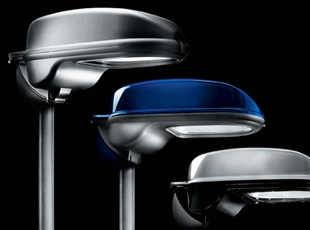 Progetto Energia Dark Sky® is the unique “one stop shop solution”, from the luminaire through the lighting controls and management systems, that offers the ultimate control in lighting outdoor areas of all kinds. 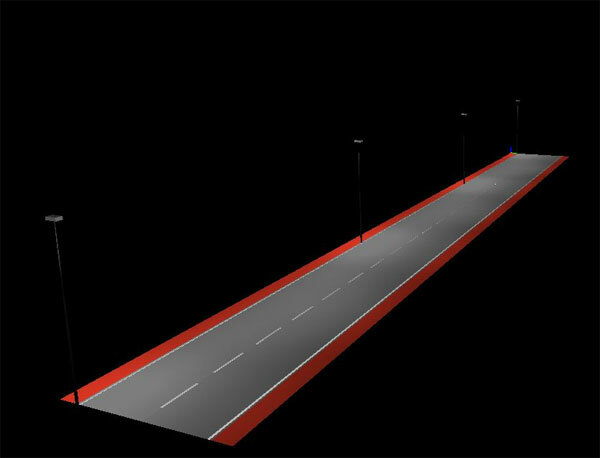 The lighting control, according to CEN/TR13201-1 and EN 13201 - 2/3/4 or UNI 10439 or DIN 5044 and ISO 50001 EMS standards is only possible if there are the best safety conditions for road users. - A smart meter accurately calculates the energy consumption, taking into account the varying rates and automatically bills all entities with a full web based report. Compact size and low weight provide design flexibility and easy installation. In other words: + 100 % of system availability. 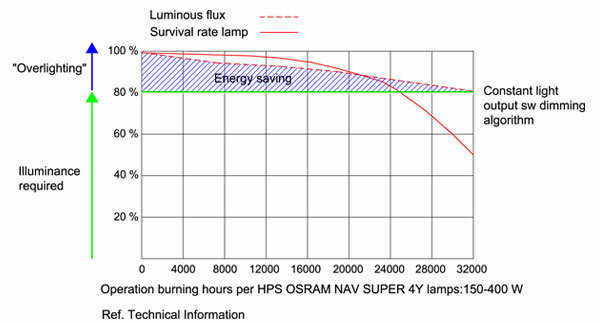 A lighting upgrade is a systematic method for planning upgrades that maximize energy savings. When the staged approach is performed sequentially, each stage includes changes that will affect the upgrades performed in subsequent stages, thus setting the overall process up for the greatest energy and cost savings possible. 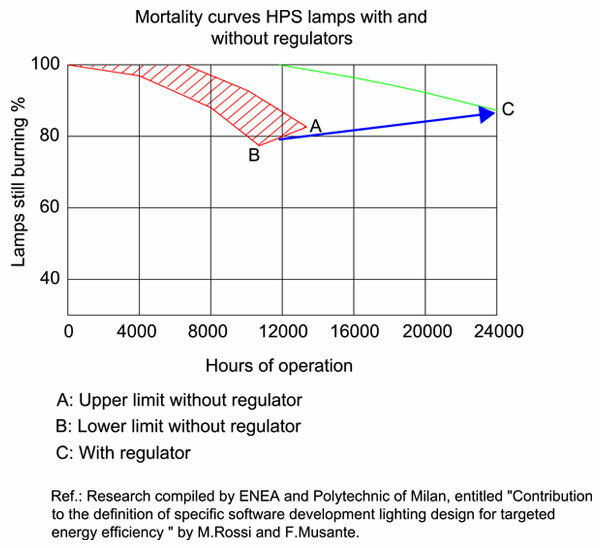 Maintenance costs can be further minimized by limiting the number of different types of lamps that must be stocked and by choosing lamps with maximum rated life to reduce burnout rate. Regulating and controlling, the light output of each luminaire, to get the appropriate amount of light for the tasks to be performed, according to CEN/TR13201-1 and EN 13201 - 2/3/4 or UNI 10439 or DIN 5044 and ISO 50001, whilst controlling the power and supply voltage quality, or reducing the voltage drops, or lowering the lamp high inrush current, for the whole life of the lamp, ensures a longer lamp and driver lifetime, with an extended lamp life, from point A or B to C.
In other words the soft ignition, the control of electrical and thermal stresses and the usage of the really needed quantity of light, doubles the lamp lifetime. 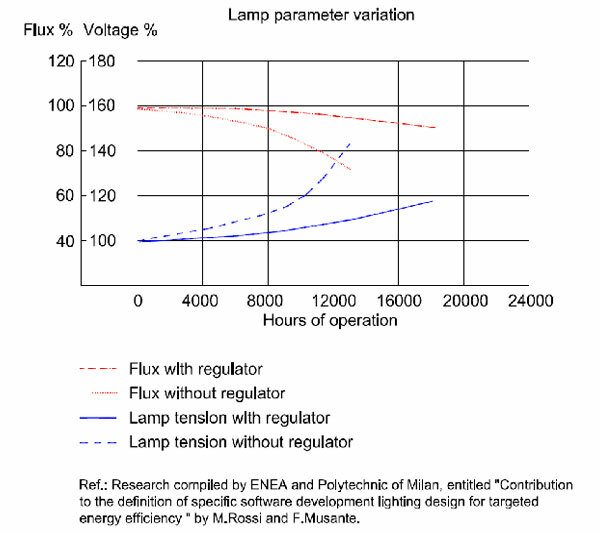 To account for lighting-system degradation, designers typically oversize initial light output by 20 percent or more, to "maintain" minimum target illumination levels when lamps are changed and fixtures cleaned. To ensure the required illuminance the Constant Light Output (CPO) function compensates the deprecation of light output of the installation and eliminates the initial over-lighting. 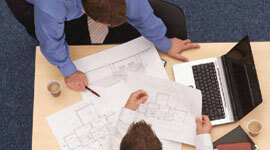 Depending on the installation, energy savings between 8% and 10% are very likely to achieve. The longitudinal uniformity, the required lighting level and the light pole spacing, especially in an existing outdoor lighting relamping, are usually the limiting factors in determining the lamp power. Simply the lamp power needed doesn't exist. This leaves the lighting designer with no alternative but to choose the next highest wattage available, which of course inevitably leads to over-lighting. The “Digital Lamp” function enables you to use exactly the designed power value, reducing the fixed light output to the required level, only with “a click of mouse”, while achieving a better light quality, with a bigger general uniformity. Depending on the installation, energy savings between 15% and 25% are very likely to achieve, while improving the General Uniformity up to 25% . Copyright © 2019 Progetto Energia E.S.Co. - Energy Service Company. All Rights Reserved.